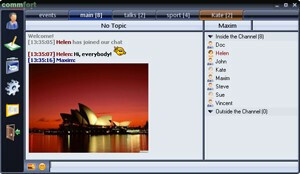 CommFort 3.20 is chat & instant messaging software developed by commfort.com. CommFort is a client-server chat with voice chat support designed for use in local networks. It combines all attributes of the best network communication utility, such as channels-based chat, user profiles, file and folder transfers, sound notification system and 100 graphical emoticons. The program has a well-rounded user interface, which is easy to work for both experienced users and chat first-timers. This program is shareware, which means you can download and use CommFort 3.20 for free during 30-days trial period. After this period you gonna have to buy CommFort 3.20 software for $79.00 or uninstall the program. CommFort 3.20 supports English, German, Russian, Italian interface languages and works with Windows 98/XP/Vista. We have tested CommFort 3.20 for spyware and adware modules. The software is absolutely safe to install. Our website has thoroughly tested communications product CommFort 3.20, written the review and uploaded installation file (4930K) to our fast server. Downloading CommFort 3.20 will take minute if you use fast ADSL connection. FirstClass Client allows you to connect to First Class networks to send Intranet email, exchange files, chat, and more. Elektron is server software providing RADIUS/802. Control network backup, recovery and retention workflows from one control point.